At the beginning of January 1969 I received a phone call from Tony Smith, a friend of my sister’s. Although born in Cambridge, he had spent most of his life abroad because his father was in the armed services. He now worked at the BBC Gramophone Library in London, but he was also a songwriter, and he had heard that I had a songwriting contract with the Beatles’ company, Apple Publishing. Tony said he had just started a vocal group and he would like my opinion. It sounded interesting. The group had been together for less than a month. In mid-December 1968 Tony had wanted to record a couple of his songs and had enlisted a colleague from the BBC, Alec Reid, to produce the session for him. They needed some backing singers and Alec had suggested Gabrielle Field, a secretary with the BBC World Service and an actress with the BBC’s Ariel Theatre Group. She brought along her best friend, Kathy Manuell, who worked in the research department at an advertising agency and was also studying classical singing at the Guildhall School of Music. The girls had been friends since the age of three and had gone to a convent school together in Bexleyheath, in Kent, where they sang in an amateur group called The Stevettes. Another of Tony’s colleagues in the BBC Gramophone Library was John Mulcahy-Morgan. John’s father had also served in the army. Born in Cairo, he now lived in Northwood, in north London, and he played the drums for a semi-pro rock group called Free Expression. John came along to the session and he brought with him the group’s singer, Geoff Ramseyer. They recorded two songs and when they listened back afterwards it sounded so good that Tony suggested they form a group. I went to see them rehearsing at the girls’ flat in Baron’s Court, in west London. The harmonies were glorious, the songs were catchy and original, and the girls had beautiful soprano voices that gave the group a unique sound. Over the next few weeks I attended several more rehearsals. I have always loved singing harmonies and I started to sing along on some of their songs. 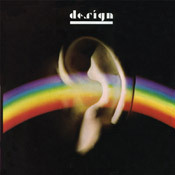 One day Tony invited me to join them and on 24 February 1969 I became the sixth member of Design. We were all aged 19 or 20. The girls were convent educated and the boys had all been to private fee-paying schools. I was an Old Etonian and John had been to Wellington, so we were very different from most groups at that time. Later the press would describe us as ‘an upper-crust chorus’, but we always believed our education was irrelevant. 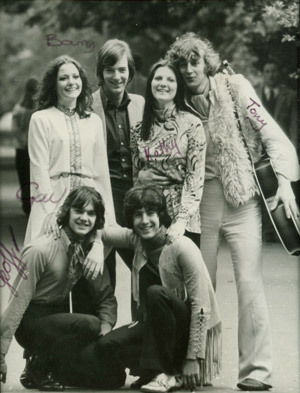 We were serious about creating an original vocal harmony sound using our various musical influences – Tony and I were folk-based singer-songwriters, while Gabrielle and Kathy had received classical training, and John and Geoff were from a rock group. Things started to move fast. We all had day jobs and we used to rehearse in Tony’s flat every night after work. But we lived miles away from each other and wasted half the evening getting to and from the rehearsals. We decided it would be simpler to rent a flat together, so we could rehearse whenever we liked. Just two weeks after joining the group, I left home, and we all moved into a basement flat in Collingham Road, in Earl’s Court. Soon afterwards we had a visit from Adrian Kerridge, who had engineered several of the hits by the Dave Clark Five, and was now head of Lansdowne Studios. One of his engineers, Peter Gallen, knew Tony and had persuaded Adrian to listen to us. We sang him all the songs we knew. A few days later he offered us a recording contract, and on 21 April 1969 we signed with his production company, Motive Music International, which he owned jointly with the musical arranger and composer, Sydney Dale. We soon encountered a serious problem. The group had only ever sung with Tony playing his 12-string guitar and we had developed a harmonic style in which our six voices filled the gaps normally played by the other instruments. When we sang with backing musicians for the first time, it simply did not work. We decided that the only way we could preserve our distinctive sound was to record the tracks with our voices and Tony’s guitar and for Syd Dale to add the other musicians later. It is the complete opposite to how recordings are usually made but it worked for us and we recorded the whole of our first album in this way. For the next six months we went to our jobs during the day and then returned to the flat and rehearsed every evening. Whenever a new song was ready, we would go into Lansdowne Studios, often at five o’clock in the morning, or at midnight, when the studio was not being used. By the end of the year we had completed enough songs for an album. Most of the album was written by Tony. There were pop songs like ‘Coloured Mile’, ‘Thinkin’’ and ‘Marguaretta’, story songs like ‘Matchbox Man’ and ‘Buttercup Stranger’, and the beautiful ballad ‘The Lonely’, sung by the girls in perfect unison. Our favourites were the more unusual tracks, ‘Speak’, ‘Children of the Mist’ and ‘Dawn Chorus’, which ignored the traditional verse and chorus structure of most pop songs and were more like song cycles with different themes and movements. Not very commercial, perhaps, but exciting to sing and unlike any other group at the time. The final song, ‘The Minstrel’s Theme’, had been written by me when I was at Apple and was about my girlfriend, Josephine, but by the time Design recorded it, she had left me and married someone else! During the summer we had auditioned for BBC Radio and our first radio session was for the late night Radio Two programme Night Ride with Jon Curle. It was broadcast on 29 October 1969, the first time any of Design’s music was heard on the air. By the end of the year we had been booked to record five more radio shows and we started to earn some money for the first time. Now the album was finished, in January 1970 Syd Dale decided to use his publishing contacts in the USA to secure a record deal. At the last moment Tony wrote a song called ‘Willow Stream’, his most commercial so far, so we rushed into Lansdowne to record it, and it was added to the album only hours before Syd flew off to the States. A week later he returned in triumph. His great friend Al Gallico, a leading independent music publisher, had introduced Syd to Larry Cohn at Epic Records. After listening to the first three songs on the album, Cohn had offered Design a worldwide record deal for two albums and an advance of $25,000. We were amazed. Very few British artists had ever signed a record deal with an American label. Especially an unknown vocal group. We thought it would open the door to the American market but we did not realise the problems it would cause later. Now that the group was earning some money we were able to give up our jobs and we all moved into a much larger flat a few streets away in Rosary Gardens. We even had space for a grand piano in the living room. The radio bookings continued to come in and we recorded more than a dozen sessions for Radio Two. To fill out our sound, we started using an extra guitarist, Jeff Matthews, who had been the lead guitarist in John and Geoff’s old group Free Expression. When they split up he had returned to college in Brighton to study for his Bachelor of Science as a quantity surveyor. After qualifying he had slept on our floor for a while before moving into the flat upstairs from us. Jeff was a superb guitarist and could play acoustic or electric and even bass guitar when necessary. He soon became an indispensable member of our team. 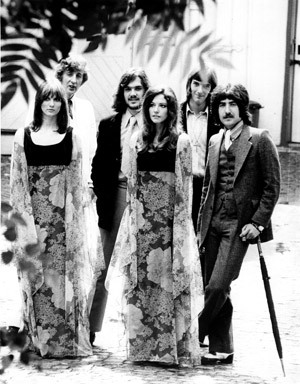 Epic Records released ‘Willow Stream’ as our first single in the USA on 25 May 1970. It was chosen by Cashbox and Variety as one of the best singles of the week, with Variety describing the song as ‘a smooth flowing pop-rocker with an emphasis on Fifth Dimension-like harmonies’. It also picked up some airplay from a few radio stations, but without any promotion it failed to take off. ‘Willow Stream’ was released by CBS Records in the UK on 17 July 1970. We had been introduced to a young American agent called Alan Frey, who had recently arrived in England to set up the London office of the talent agency IFA. He offered to help us and almost immediately he came up with our first television show. It was a TV special called South Bank Summer and was filmed at the Queen Elizabeth Hall on London’s South Bank. Before it was transmitted we were booked on two more TV shows. The Golden Shot went out live from Birmingham and in order to appear on the show, we had to join the actors’ union Equity. There was already another member with a similar name, so I had to change mine, and I adopted the professional name of Barry Alexander. All went well on The Golden Shot until the journey home, when Tony collapsed in agony. We rushed him to hospital where he was diagnosed with an ulcer and a ruptured hernia. We had to appear on Stewpot for the first time without him. The single had received some good reviews but it did not sell. Alan Frey told us we needed to get some live experience before he could book us in America and he arranged a month-long tour of US army and NATO bases in Germany and Italy. Against the advice of his doctors, Tony was wrapped up in bandages, and in September we set off for Germany. The tour went wrong from the start. We had never performed professionally on stage before and our expensive new PA system did not work properly. Tony had to sing sitting down because of his hernia, and the American servicemen did not like our music. To make it worse, when Alan Frey heard what had happened, he became unavailable on the phone, and our hopes of performing in America suddenly evaporated. This was when we began to realise our recording deal was a mistake. Our first album had still not been released in the USA because Epic were waiting for us to go there to promote it first, and CBS in the UK were refusing to release it before America. We had to ring Larry Cohn in New York and persuade him to issue the album and another single, ‘Coloured Mile’. The failure of the tour affected Tony more than anyone. He was still not well and he became gradually more depressed. He says now, ‘I realised that I didn’t enjoy being on television or having to perform on stage with the group. I hadn’t really thought it through. I preferred writing and being in the studio.’ One morning in November we awoke to find he had gone. A few days later, we had a call from Alec Reid to say that Tony was leaving the group. We were stunned. Tony had created Design, wrote most of the songs, arranged the harmonies, sang lead vocals, played the guitar, co-produced the records, and even managed our bookings. In hindsight, it was all too much. Once the shock of Tony’s departure had sunk in, we had to decide what to do next. It was Geoff who pulled us all together and said, ‘Come on, we can do this without Tony.’ We had no money, or work, but our first album was about to be released in the States and if we could finish the second album we could collect the rest of the advance due under our contract with Epic. We also had no manager or agent. We had always handled everything ourselves but it was obvious we needed help if we wanted any success. Syd Dale introduced us to an impresario called John Coast, who represented some of the world’s leading opera stars, as well as singers such as Nana Mouskouri. He and his partner, Frank Powis, agreed to take us on. Finally, things started to happen. Our first album was released in the USA at the end of 1970. We had intended to call it Children of the Mist and had commissioned a cover drawing by an art student called John Ireland. It showed four children looking out over a mythological landscape. When we saw the American album cover we were horrified. They had created their own artwork – a huge ear with a rainbow over it. We protested but it was too late to change it. Since then, the obscure cover has helped to make our only US album release a favourite with collectors. One Italian website has even described it as ‘the Holy Grail of soft rock’!